Are you looking for the best place in Brainerd for lunch or dinner? Brick House Pizza is a clean, friendly and comfortable environment where the service is fast and the food is fabulous! You want the best pizza in town? Dine-In, Take-Out or Delivered to your home or office. Plan your next meeting or get-together at Brick House. There’s always plenty of room. It’s a quiet place where good conversation is always in vogue. 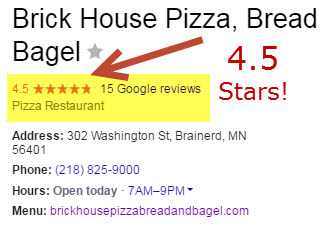 Check out or ratings on Google – The Best in Brainerd! Choose from over a dozen specialty pizzas. Add the toppings of your choice to spice them up! Check out our pizza menu HERE! A New York Style Deli with Fresh Baked Goods! We bake the old fashioned way! We understand bread and bakery items are important comforts in our every day lives, so we’ve gone back to the values that bakeries had generations back. Bakers arrive while everyone else is just getting into a good dream to carefully begin a process to ensure you get the best breads and bagels in the North Country! Our bagel dough is prepared on a large wooden table and allowed to breathe and naturally reach the perfect consistency before being boiled and then baked on burlap boards. The boiling provides that “just-right” texture on the outside while the burlap allows the bagels to bake with air circulation all around, giving them the moist, chewy interior that delight our customers. And just like the old days: NO PRESERVATIVES! Just the simple ingredients allowing you to enjoy their freshness the day they were baked, which happens to be every day at Brick House Pizza, Bread ‘n Bagel!